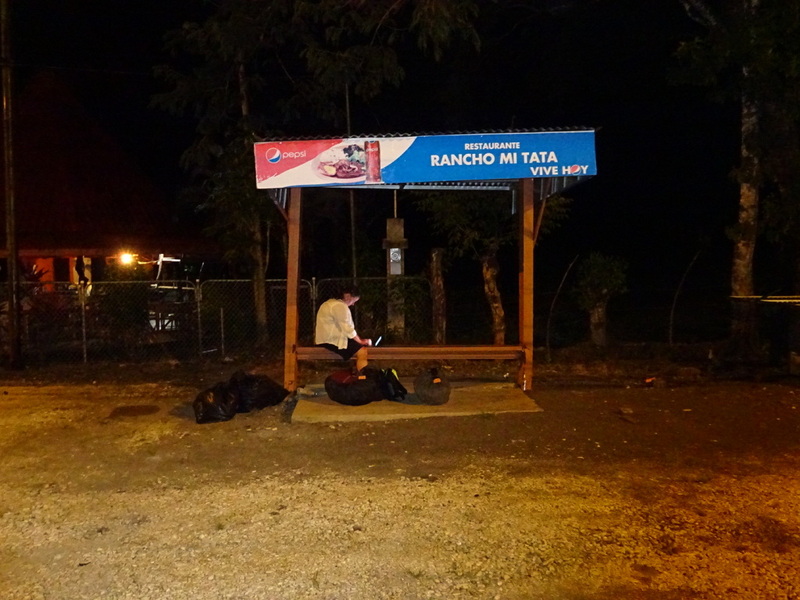 Well into the small hours – Anner waits at the side of the road for the Tica Bus (and blogs). Taking the overnight bus from Costa Rica to Panama seemed like a great idea when we heard about it in the States. 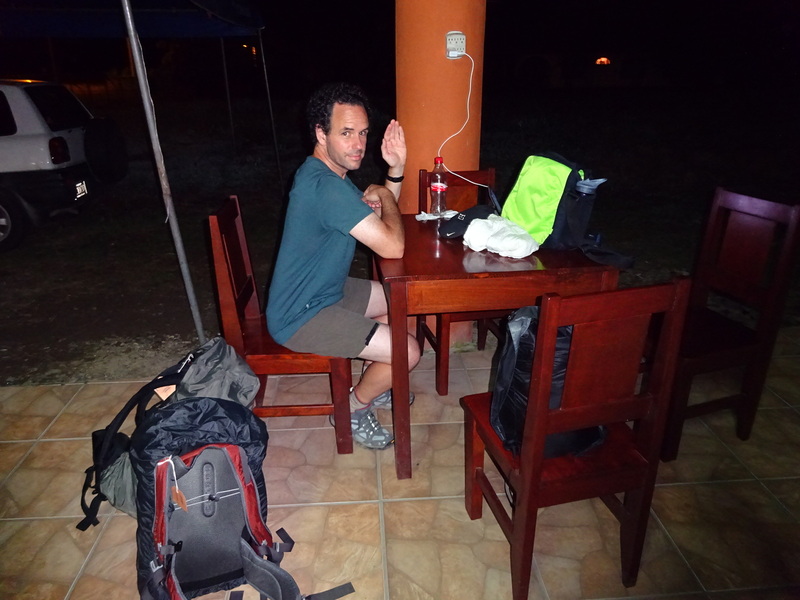 In fact, our travel doctor recommended it…something to do with malarial mosquitos biting at night, so better to be in a bus during that part of Panama. Not sure I totally followed the logic, but I know she recommended it. Anyway, as part of the entrance requirement for Costa Rica you have to have a ticket out of Costa Rica (“proof of onward travel”) and that resulted in us hurrying to purchase a Tica Bus ticket from San Jose, Costa Rica to Panama City a couple of days before we left the US — long before we had any idea where our explorations might take us. We were scheduled to board the bus at something like 11:00pm, ride all night, cross the border and arrive in Panama City the next day. Sounds tiring, but do-able, right? In fact, we convinced ourselves that it would be totally civilized. Lets just say I didn’t feel so civilized when we ended up under a street lamp at 1:30 in the morning waiting for our 4am bus. Aaron waiting in the truck stop. We spent the first seven hours there before we had to vacate to the road. So what happened? 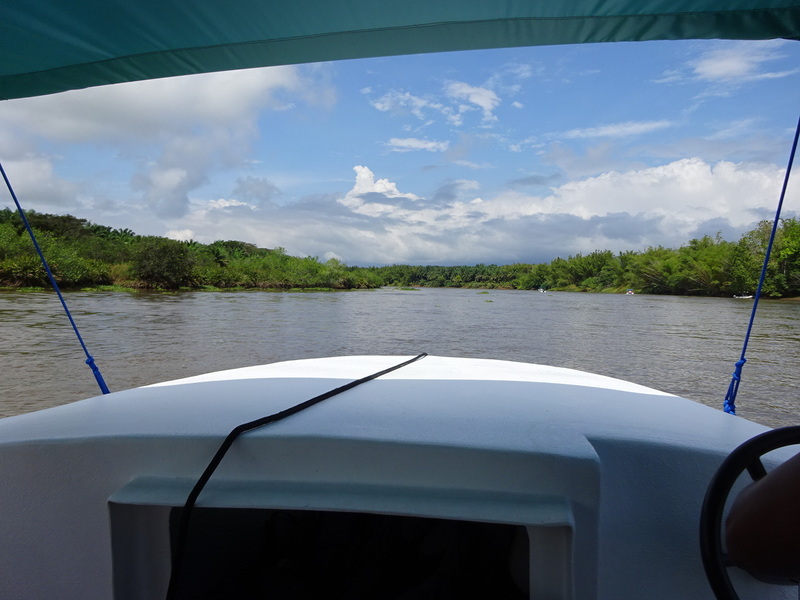 Well, after entering Costa Rica, we’d been working our way pretty steadily south towards Panama. Didn’t plan that, it just sort of happened. Anyway, when it came time to head here to Panama, we didn’t want to bus way north to San Jose just to turn-around and take the bus right back south again. 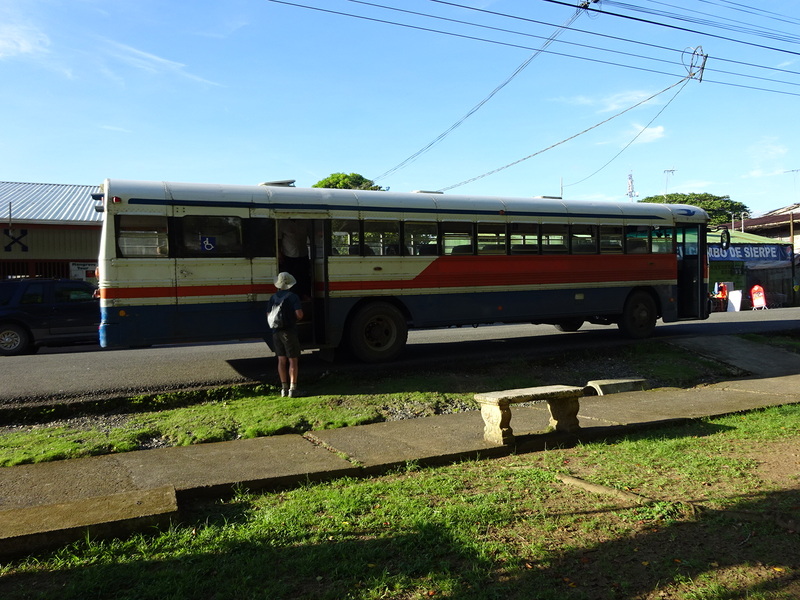 Checking with various folks, including the Tica Bus company itself, we learned we could switch to catch the bus near where we were in Drake Bay as it passed by after leaving San Jose…the question was exactly where and when it would arrive. We’re not entirely sure where it all went wrong, but what we thought we had changed our ticket to was a 1:00am pickup at what we assumed was a late-night restaurant. When we arrived at the restaurant (aka: truck stop) we were informed that the actual pick-up time is around 2, no 3, perhaps 4, well, probably 3:30, maybe… AND the restaurant closes at midnight, after which we will be on our own. On the side of the PanAmerican Highway. Alone. Did I mentioned on the side of the street? Oy. At that point there was nothing to be done but tough it out. This is the stuff long-term travel is made of and what distinguishes our journey from pre-paid, all-inclusive holidays. On the plus side, we were at the right stop, it was a nice night out, not too many bugs, seemed safe and it wasn’t too hot or too rainy. So it couldn’t be so bad, could it? 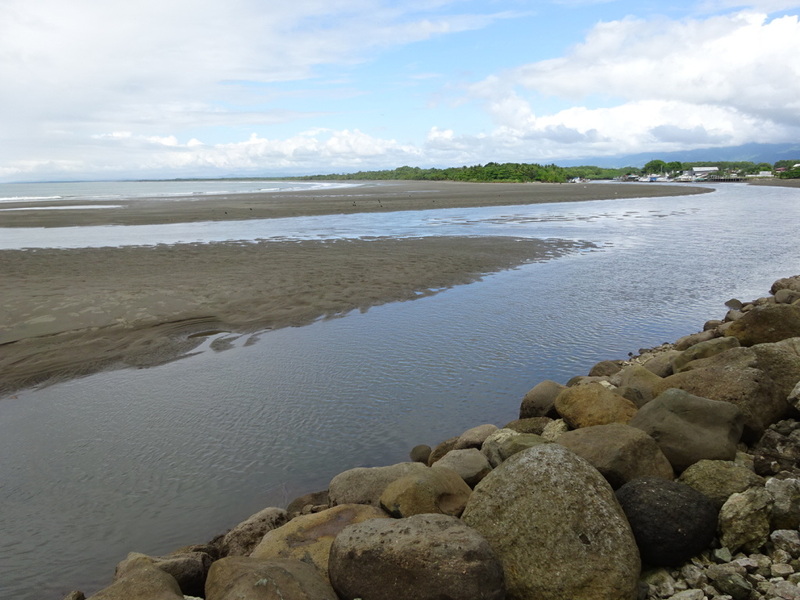 We got up on Saturday morning, moved out of the hotel room, walked the beach killing time, taxi to the boat, 90 min boat ride to Sierpe (past palm trees and mangrove forests – beautiful!! ), 40 min school bus ride to Palmar Norte, taxi ride to rest stop restaurant, wait at the rest stop (not so restful) for 10 hours(!!!!! 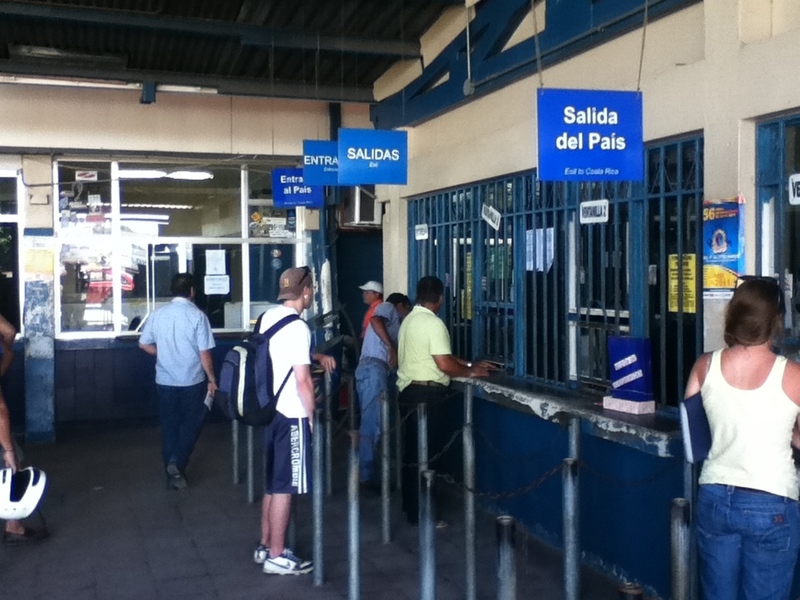 ), bus picked us up at 3:30 am, about an hour later we were at the border. Aaron in the boat to Sierpe. This part of the commute is stunning. 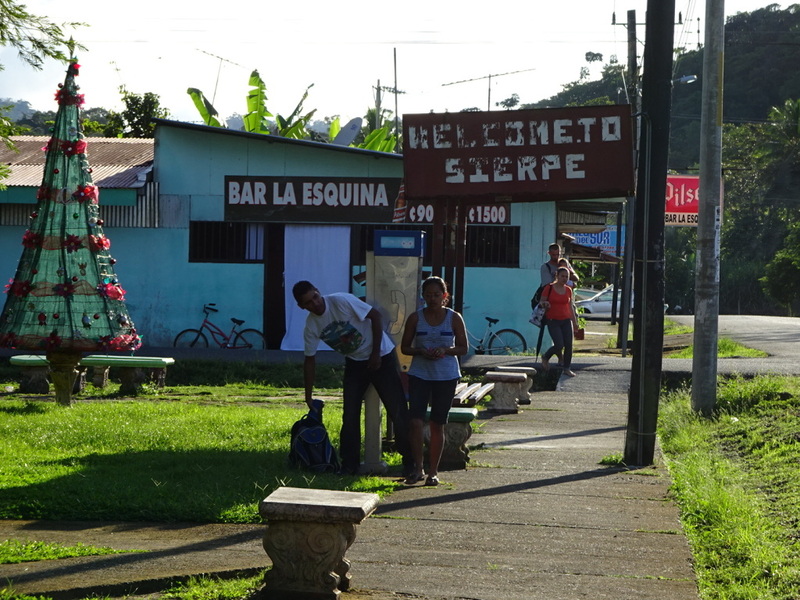 Handful of visitors in Sierpe. Aaron talks to the driver of the bus that will take us from Sierpe to Palmar Norte. We are the only Gringos on the bus… still in very good spirits at this point in the journey. Then the bus drops us at Customs and leaves! Just rolls away and leaves us! We all wait 90 mins for customs to open – yep, 90 more minutes of just standing in line! 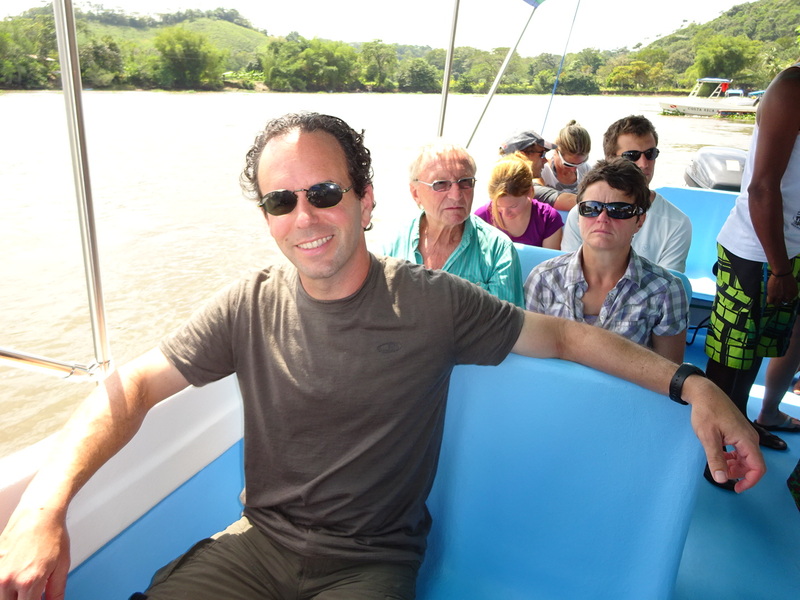 We check out of CR which also involved having to pay a tax – but the tax collectors aren’t open that early so we have to pay a contractor who works out of the back of a van an extra buck apiece – good times. I am grateful Aaron handled that part. Then we walk down the road a few hundred meters to check into Panama which was total chaos! Luckily Aaron found the right line for us where we pay more taxes, prove that we have enough money to stay awhile and they stamp our passports. Not done yet – we sit in the hot, beating-down sun (already broiling by 7am!) until everyone on our bus is through the line (note: people are scattered like dust in wind and mixing with hundreds of other people not from the bus – total craziness). At that point, we have to pull our bags off the bus and are directed into a room where they take attendance and check our bags. Except us. We hand over our form and the man grabs it and signals us to leave. (I assumed backpackers would be under more scrutiny, but maybe middle age, rather cleaned-up backpackers don’t count. Fine by me!) 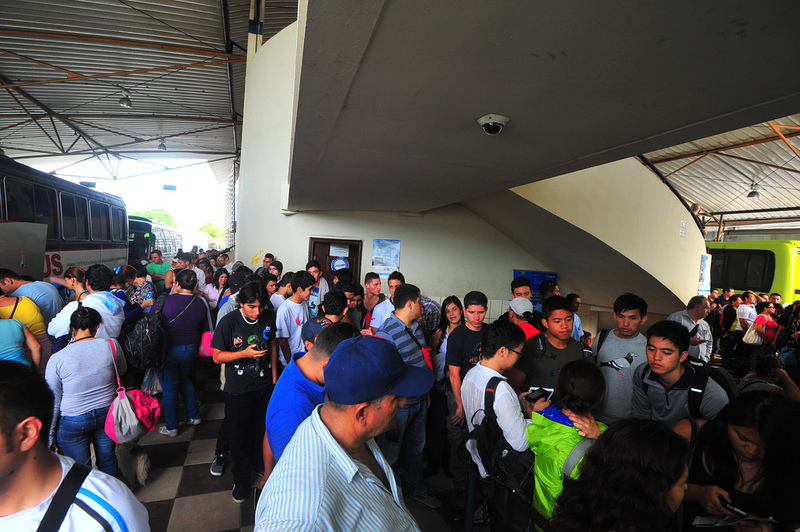 Four hours after arriving at the border we are back on the bus. I start to doze off, but wake when a soldier boards our bus for one final passport check. Okay, I am not a fan of that part at all. I put on a stoic, “this happens all the time” face, but really I was pleased when the guys with guns exited the bus. A final eight hour bus ride got us to Panama City, 15 minute taxi to the hostel…aaaaand collapse! Slept for 12 hours. Did nothing the next day. And much of the next! If anyone would like to offer to take that on for us next time, we’re quite willing to let you enjoy the experience for us. Exiting Costa Rica. When we did it, it was dawn and mobbed full of people – this picture is from the web. A view of the mob of people, busses (imagine a lot of loud engines and fuel smell and flocks of birds skwaking in the sky). This is the room where they called our name and then checked bags. Another web shot – there were MANY more people our day, but it is the same room! 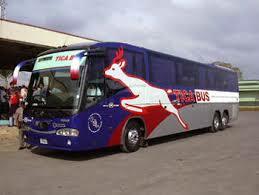 In case you are curious, this is what a Tica Bus looks like. Thank you, Internet. My dad used to say, “You have more time than you have money” and this was definitely one of those occasions. The trip cost the two of us $132 total, which isn’t bad at all. On the other hand, 400 miles and 6 different transports over 27 hours wasn’t exactly fun. Hope we don’t have to do that again any time soon – we’ll be flying to Ecuador, thank you very much! 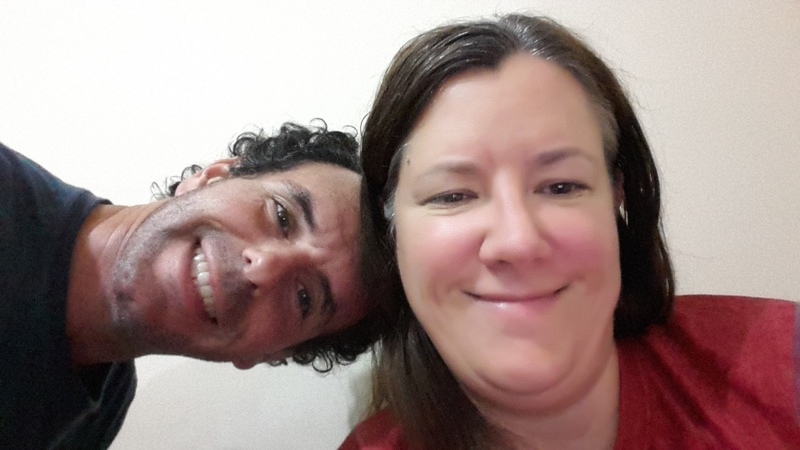 Moments before we both collapse into 12+ hours of sleep we snapped this selfie…utterly giddy to be off the road and into our hostel. Hello Panama. « Big, Exciting, Thrilling News! Ok. This is the first post I read where I do not feel green of envy. I’m actually reading it while enjoying my half-hour bus comute. Glad that you made it safe and sound. I’m glad you are safe and able to catch up on some sleep.This is an experience you will never forget!! Agreed! Let’s hope it’s awhile before this same experience comes up again! As previously noted, “adventure” is what happens in the re-telling months or years after the heat, bugs, late nights and fatigue are behind you!